2018 saw two important developments for the Journal of Belarusian Studies. We welcomed Alena Marková from Charles University in Prague and Siarhei Bohdan from Free University of Berlin as the Journal’s co-editors. Second, the Journal has been accepted for inclusion in the SCOPUS database, the world’s largest citation index of peer-reviewed literature. This will no doubt improve the journal’s attraction for both readers and authors. The Journal is already indexed by EBSCO, ERIH PLUS, Google Scholar and other databases. This issue features contributions from Belarus, the Czech Republic, Germany and the United Kingdom. Our authors look at a variety of topics, although on this occasion the content mostly relates to the Soviet period of Belarusian history – including coverage of protestant communities in Soviet Belarus, the cult of Stalin, nation-formation in Belarus, and Belarusian émigrés in interwar Czechoslovakia. Thomas Bohn and Rayk Einax from Justus-Liebig-University in Germany draw on extensive sources and analyse how the Pentecostals of Soviet-era Belarus managed to succeed in preserving their common faith, despite a restrictive environment that brought constant pressure from the militia and KGB. They argue that the Pentecostals’ perseverance and ‘moral courage’ posed one of the biggest challenges for the Soviet state at its periphery and the Soviet rulers failed to force them into submission. 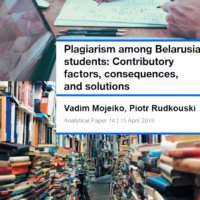 Alena Marková from Charles University in Prague wrote her article on the basis of the Annual London Lecture on Belarusian Studies, which she delivered in March 2018. She argues that Belarus’s processes of nation-building and nation-formation are unique in the context of other European national movements. She contrasts them to post-Soviet neo-Belarusization, which took place from 1990 to 1995. Despite these both being rather brief periods, they had a profound effect on the formation of the Belarusian national and state. Aliaksandr Huzhalouski from the Belarusian State University analyses the cult of Stalin in Belarus. He discusses its peculiar tools such as everyday political education and various political campaigns, the cult in literature and art, as well as the strengthening of it through place names. He points out that Stalin’s cult of personality formed within the confines of a much broader Soviet society-building project which was based on paternalistic, illiberal and authoritarian values. However, Soviet Belarusian society was not monolithic in exhibiting its fawning devotion to the dictator and the author analyses the resistance to the establishment of Stalin’s cult of personality. Daniela Kolenovská from the Academy of Sciences of the Czech Republic examines the history of Belarusian émigrés in interwar Czechoslovakia. These emigres went through different stages in their relations with the Czech authorities. The article concludes that the anti-Soviet nature of the new Belarusian programme was politically anchored in Germany while the Czechs preferred Stalin’s antifascism to Hitler’s anticommunism. This split caused a fatal lack of Czech or Slovak willingness to protect Belarusians against Soviet despotism after the Second World War. Book reviews in this issue cover the Ballads of Uladzimier Arloŭ written by Arnold McMillin, a review of a new book Politics and Politicians in Soviet Belarus by Angelika Pobedonostseva Kaya, as well as Adam Coman’s review of a book on “the Jewish Revolution” in Belorussia and its impact on economy, race and the Bolshevik power. The issue also includes a traditional annual overview of activities of the Anglo-Belarusian Society written by its chairman Brian Bennett. The Journal of Belarusian Studies continues to accept submissions on a rolling basis and welcomes contributions from both younger and established academics on all aspects of Belarusian studies. 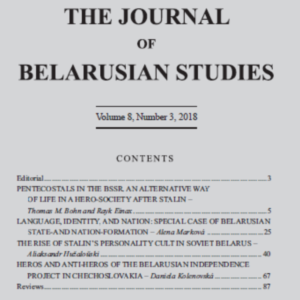 Order a hard copy of the 2018 Issue of the Journal of Belarusian Studies. While Belarus hedges carefully between East and West, Minsk and Brussels both claim they are eager to deepen ties. Lukashenka and Putin meet for the fourth time over the course of two months. Arguments about oil and gas prices have become a recurring feature of the Belarus-Russia relationship. Experts see the major threats in 2019 in Russo-Belarusian security relations that are likely to remain the least prone to conflicts. EAST Research Center proposes implementing security measures to strengthen the information security of Belarus. Minsk’s muddled media clampdown could jeopardize the warming of relations with the West. Lukashenka plans to run for the sixth term in 2020 and might change the constitution. Belarus’ bold attempt to attract foreign investors in IT sector gets restricted by the country’s autocratic regime. Since 1994, the proportion of Belarusian-language education has been shrinking at all levels. How Close Can Belarus And EU Really Get? 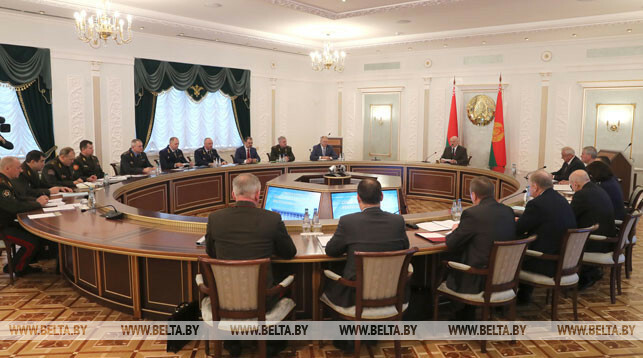 – This week senior EU official, the Commissioner for Budget and Human Resources Gunther Oettinger visited Minsk and met Alexander Lukashenka (as well as civic activists). Minsk and Brussels both claim they are eager to deepen ties, but the pace of rapprochement is slow. TUT.by political editor Artyom Shraibman analyzes what realistically can be achieved in Belarus-EU relations. 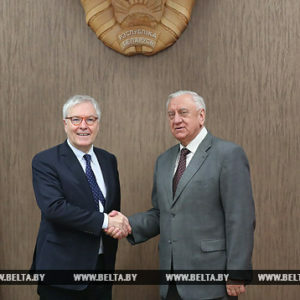 Belarus Finds its Foreign Policy Stride – Yauheni Preiherman, Minsk Dialogue, emphasizes that Belarus hedges carefully between East and West, like a hedgehog and a fox all at once. Over the next five years, the country must ensure that it becomes part and parcel of the mental (strategic) maps of both the West and Russia and specifically as a principal stakeholder in Eastern European stability. Cautious Optimism in Belarus’s Growing Geopolitical Leverage – Grigory Ioffe continues to overview alarmist pronouncements regarding Belarus. In particular, he refers to an interview of NATO former secretary general Anders Fogh Rasmussen who predicted that unless Belarus launches “reforms leading to democracy and freedom” it would fall victim to war and annexation by Russia. A Brotherly Takeover: Could Russia Annex Belarus? – Artyom Shraibman, writing for Carnegie Moscow Center, comments an opinion that the Kremlin’s recent demand to integrate with Belarus further would be an opportunity for Putin to remain in office after 2024. But the journalist believes that if Putin wishes to remain president after 2024, annexing Belarus is rife with unpredictable risks. A better option would simply be to amend the Russian Constitution. Belarus’ Balancing Act – David A. Wemer, Atlantic Council, comments a speech of deputy minister of foreign affairs for Belarus, Oleg Kravchenko at the Atlantic Council on January 30. In brief, Belarus is attempting a delicate diplomatic dance as it attempts to thaw its relationship with the West while preserving its longstanding relationship with Russia. 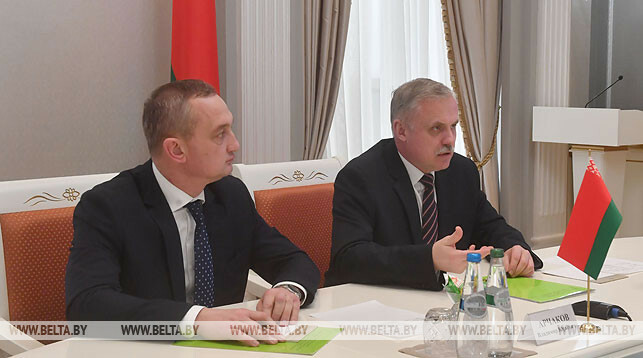 Oiling the Wheels of Belarus-Russia Relations – Arguments about oil and gas prices have become a recurring feature of the Belarusian and Russian relationship. Paul Hansbury, at New Eastern Europe, explains whether this year’s discord is different from earlier bouts, and there is any merit to the speculation of potential changes to the Union State agreement between the two countries. Alleviating Tensions Between Russia and Belarus: Two Paradigms – Grigory Ioffe analyzes debates on Russian-Belarusian tensions around the so-called oil tax manoeuvre and notes that they fall into two main categories: 1) ones carefully trying to examine the core of the issue and 2) politicized speculators. And in the new year, this latter group has remained vocal. Review 2018: Security Situation In Belarus Remained Stable – Belarus Security Blog sums up the national security “results” of 2018. In particular, there was no qualitative change in the security situation in Belarus; it should be regarded as stable. The experts see the major threats in 2019 in Russo-Belarusian security relations that are likely to remain the least prone to conflicts. Seven Specific Measures to Strengthen the Information Security of Belarus – EAST Research Center offers the following measures: increasing the diversity of media sources considering the predominance of Russian content; promoting the Belarusian national identity and culture; the creation of attractive conditions for private investors in the media market; the development of media literacy, etc. Beyond Lies: A New Stage in the Belarus-Russia Information War – In February, Alexander Lukashenka and his Russian counterpart, Vladimir Putin, met for the fourth time over the course of two months. Grigory Ioffe believes that at least in one respect, the new stage of Russian-Belarusian tensions is qualitatively different from previous stages: Lukashenka markedly preoccupied with information security. Is Lukashenka Preparing to Hand Over Power? – The political editor of TUT.BY Artyom Shraibman breaks down key political developments in and around Belarus to help make sense of them. During his recent Big Talk on March 1, Alexander Lukashenka said that he plans to run for the sixth term in 2020. What does it mean in terms of his political future? To change the constitution. Shhh! Belarus Wants You to Think It’s Turning Over a New Leaf – Amy Mackinnon, Foreign Policy, believes that Minsk’s muddled media clampdown could jeopardize warming of relations with the West. Thus, an ongoing criminal case against the editor in chief of the country’s most widely read news site [Maryna Zolotova, TUT.by] has called into question whether Minsk is committed to reforms that are more than just cosmetic. Belarusian Language In 1918-2018. Education and the Press – Andrei Rasinski, BISS, releases a comprehensive study on the Belarusian language situation over a hundred years. Since 1994, the proportion of Belarusian-language education has been shrinking at all levels. From 1995 to 2018, the number of Belarusian urban preschoolers decreased from 68.9% to 2.3%, while the number of students studying in Belarusian in universities decreased by 103 times, and now this is 291 students. Economic Values of Belarusians In 2018 – Daria Urban, IPM Research Center, releases a full report on the analysis of the economic values of the Belarusians, based on a national survey’s data. The report covers such issues as the attitude of the population to wealth, the level of state paternalism, the level of public expectations from the state, and others. The work was prepared in the framework of the Kastryčnicki Economic Forum (KEF). Sixteen results of 2018 – Strategy analytical centre and Mises Center sum up the last year’s socio-economic development of Belarus in 16 nominations. In particular, 2018 was a year of intensifying talk about the problems in the economy, rather than taking adequate and professional measures to solve them. The country continued to work in the mode of Marxist-Leninist patterns and nomenclature Robin Hoods – at the expense of taxpayers. Will Belarus’ IT Strategy Loosen Russia’s Tightening Grip? – Tatsiana Kulakevich, writing for The Globe Post, believes that Belarus’ bold attempt to attract foreign investors and loosening its dependence from Russia by experimenting with its IT sector is restricted by the country’s personalistic autocratic regime, where the state controls most of the economy, the courts, and the media.